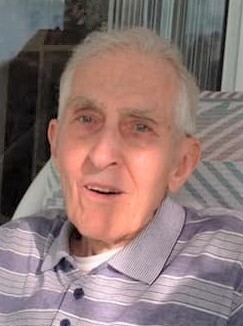 Richard L. Rothrock, age 93, of Glen Ellyn passed away January 9. Beloved husband of Greta, loving father of Janice (Steve) Kravitz and Joyce (Reggie DeChalus) Rothrock. Dear grandfather of Beth and Kyle (Melissa) Kravitz. Fond brother of Robert (Judith) and Susan (Steve) Shade. Kind uncle of many nieces and nephews. Richard was a WWII Army veteran. He fought in the Battle of the Bulge and received a Bronze Star. Visitation Friday, January 25, 10 AM - 11 AM at Leonard Memorial Home (565 Duane St., Glen Ellyn 60137). Funeral Service to follow at 11 AM. Interment to follow at Chapel Hill Gardens West, Oakbrook Terrace, IL.